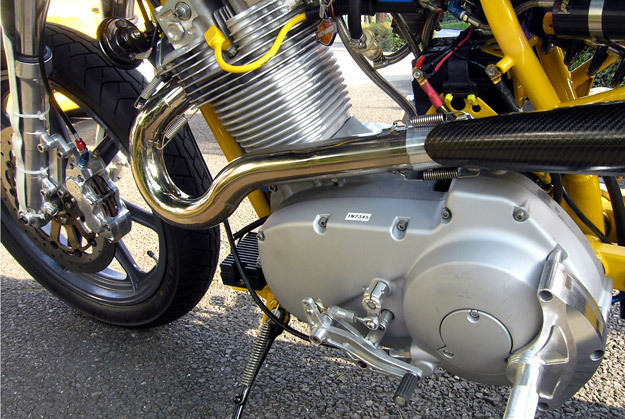 Strange fact for the day: there are only two Buell Blasts in Japan. Both were imported by Sundance—and this is the only one currently registered for street use. 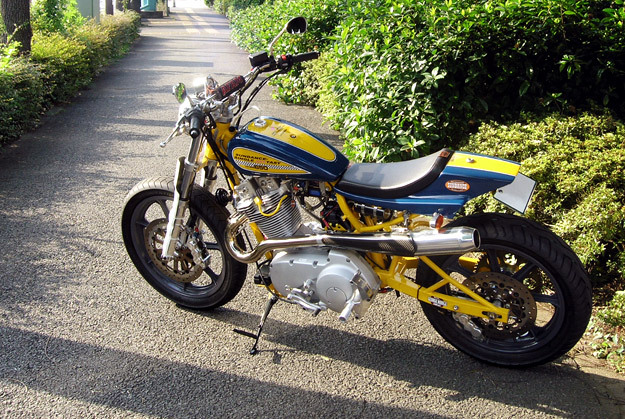 The bike was originally designed as a ‘comfy little around-town putt-putt’ for a famous Japanese TV comedian who collects oddball cars and bikes. 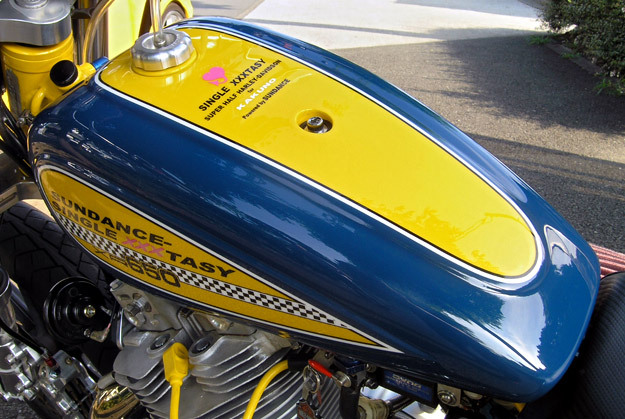 Since rechristened Single XXXtasy, it’s based on a C&J flat tracker frame created for The Motor Company’s early millennial shorttrack and TT racing effort. 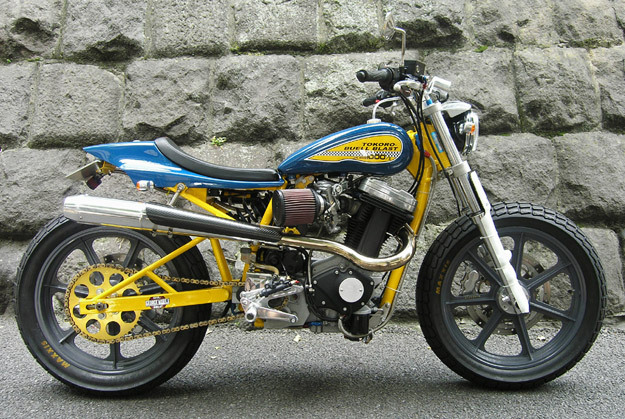 The frame was assembled into a basic rolling chassis by Richard Pollock of Mule Motorcycles—a familiar name to those who follow the comments on Bike EXIF—and sent to Tokyo. The color scheme is inspired by the old Goodyear Tire colors—blue and yellow. Originally, the stock-looking Evo-based engine was fitted with a Sundance-Keihin FCR carburetor and a hot cam. 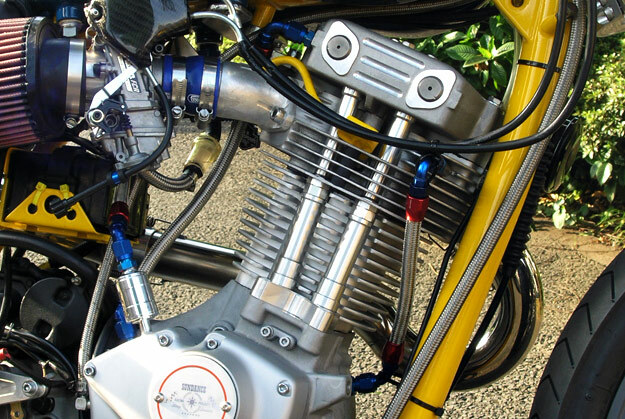 With the help of Sundance’s head porting, this took the 492cc single from around 34 to 43 hp. 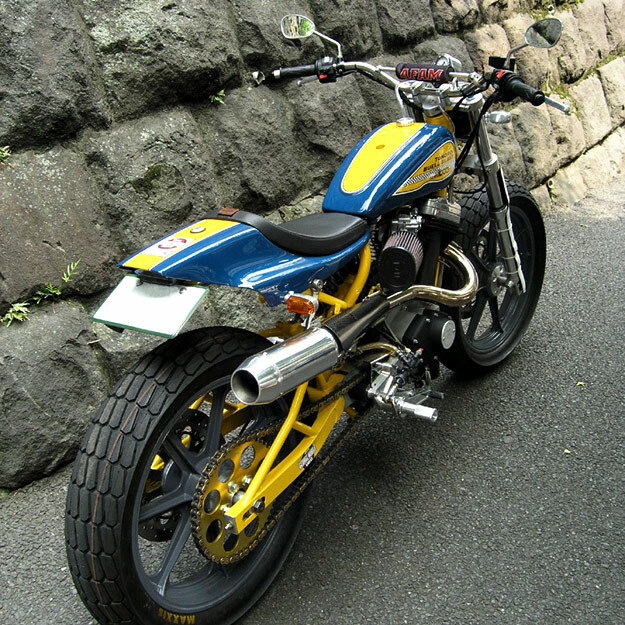 A few years later the bike was bought by a friend of Sundance owner Zak Shibazaki. The friend cajoled Zak into playing Dr. Frankenstein, and he kludged Sundance’s Super XR billet cylinder and cast head onto the Blast’s lower end. It took a lot of effort, but Zak finally managed to get the top-end to fit. 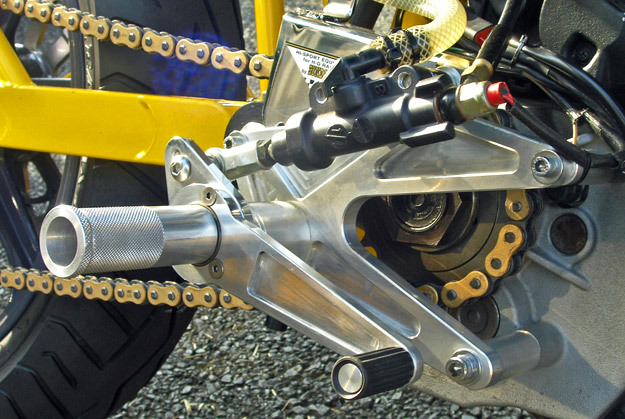 In the bargain, he swapped out the flimsy stock Buell flywheel for one with more torque-generating heft. The unusual positioning of the pushrod base tappets relative to the head also posed a bit of an engineering problem—as can be seen in the angling of the pushrod covers—but it worked out in the end. The engine now reportedly runs like a Swiss watch, but with considerably more power. Pumping out 58 hp, the owner has seen over 160 kph (100mph) on the expressways with plenty more on tap, but chickened out before finding out how fast it would go.